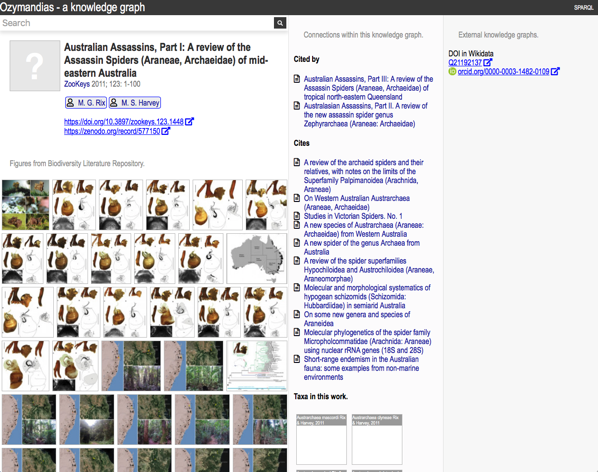 In the spirit of release early and release often, here is the first workable version of a biodiversity knowledge graph that I've been working on for Australian animals (for some background on knowledge graphs see Towards a biodiversity knowledge graph now in RIO). 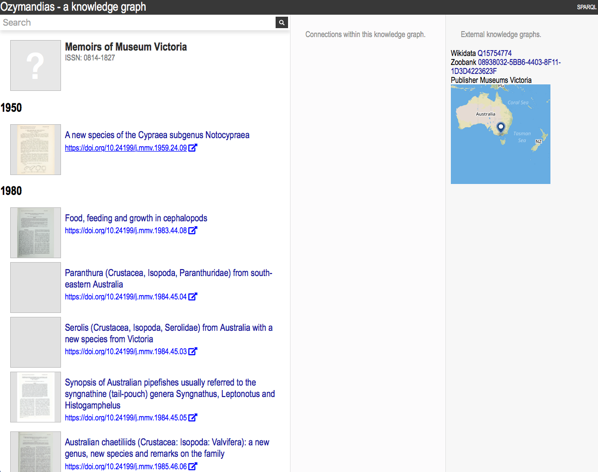 The core of this knowledge graph is a classification of animals from the Atlas of Living Australia (ALA) combined with data on taxonomic names and publications from the Australian Faunal Directory (AFD). 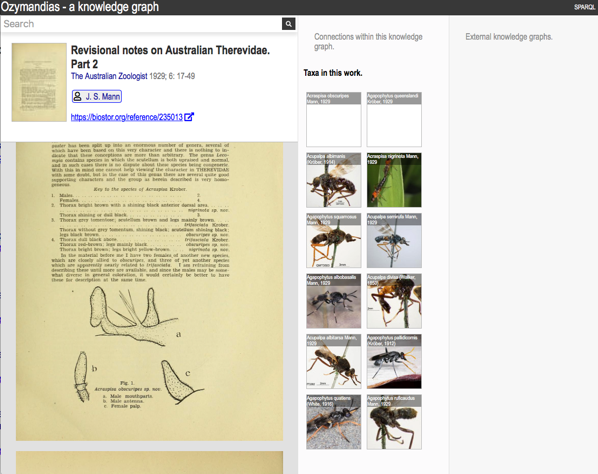 This has been enhanced by adding lots of digital identifiers (such as DOIs) to the publications and, where possible, full text either as PDFs or as page scans from the Biodiversity Heritage Library (BHL) (provided via BioStor). 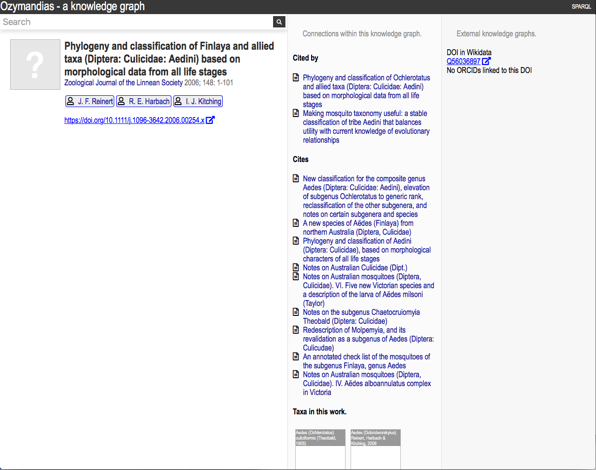 Identifiers enable us to further grow the knowledge graph, for example by adding "cites" and "cited by" links between publications (data from CrossRef), and displaying figures from the Biodiversity Literature Repository (BLR). The focus for now is on taxa, publications, journals, and people. Occurrences and sequences are on the “to do” list. As always there’s lots of data cleaning and cross linking to do, but an obvious next step is to link people’s names to identifiers such as ORCID and Wikidata ids, so that we can trace the activities of taxonomists as they discover and describe Australian biodiversity (the choice of Australia is simply to keep things manageable, and because the amount of data and digitisation they’ve done is pretty extraordinary). I’m also working to a deadline as I'm trying to get this demo wrapped up in the next couple of weeks. 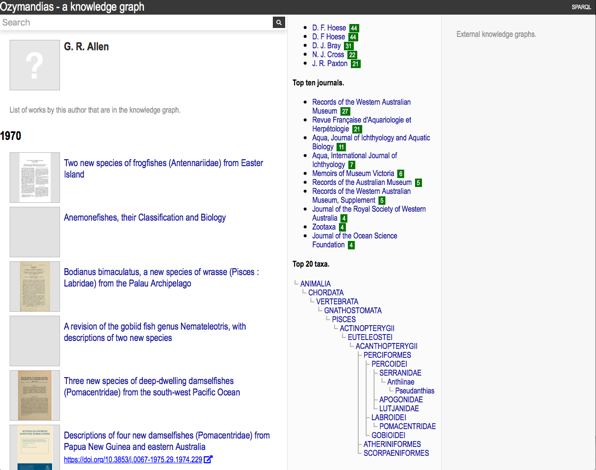 TL;DR the knowledge graph is implemented as a triple store where the data has been represented using a small number of vocabularies (mostly schema.org with some terms borrowed from TAXREF-LD and the TDWG LSID vocabularies). All results displayed in the first two panels are the result of SPARQL queries, the content in the rightmost panel comes from calls to external APIs. Search is implemented using Elasticsearch. If you are feeling brave you can query the knowledge graph directly in SPARQL. I’m constantly tweaking things and adding data and identifiers, so things are likely to break. More details and documentation will be going up on the GitHub repository.